Tanya Rosen is the founder and owner of Nutrition by Tanya which has ten branches across the Tri-State area and a newly opened international branch in Jerusalem. Tanya holds a Master’s degree from Brooklyn College, as well as many speciality certificates such as pre- and post-natal fitness, nutrition and sports nutrition. She also has certification and experience working with special populations such as children, senior citizens and athletes. 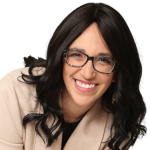 Tanya has extensive knowledge and experience in working with complex medical conditions and eating disorders. As a trainer and group class instructor, Tanya has certifications in Kickboxing, Pilates, Boot Camp, and Step. With the motto that no two classes should ever be the same, Tanya is always bringing new routines and moves to her popular classes. Tanya also writes for national newspapers and magazines, as well as working on her future book. On a personal level, Tanya understands the struggle as she herself lost 40 pounds fourteen years ago and works hard to keep it off. Thinking she would be a lawyer, Tanya got her bachelors and began applying to law schools. Found herself very overweight and unhealthy so started working out and eating healthy foods. Became enthused by the health and fitness world and switched career tracks, focusing initially on the fitness aspects. Started giving fitness classes to friends and family and then began doing local group training classes. Used her friend’s basement as a location for her classes, but opened her first store-front gym after her friend’s husband complained about the noise. Opened a second branch, but ultimately closed both branches after they failed to generate real profit. Switched emphasis from fitness to nutrition, spending the next 10 years as a local nutrition counselor. Opened her first Nutrition By Tanya branch in Borough Park in 2014, beginning her boom from low-key operations to explosive growth. Opened more branches across the Tri-State area every few months, growing her business insanely fast to its current state of 10 national branches and a brand new international branch in Jerusalem. Make your to-do list for tomorrow, but then take a look and see if there is anything you can do today. You can also de-stress when you have too many things going on by pushing off tasks to tomorrow’s list. Later on, when you might have chilled out a little, you can look at tomorrow’s list and tackle some of those tasks now. Many dramatic overnight success stories are really just like bamboo. Bamboo spends three months building a root system underground, but once it appears out of the soil, it can grow over 15 feet in less than 48 hours. A business might look like an overnight success, but in reality it spent 10 years building systems, a reputation and getting everything into place for that “overnight success”. 1. The way you look and the shape of your body depends 90% on what you eat. If you are motivated purely by aesthetics, eat healthy foods for a great look. 2. Need some motivation to exercise and maintain fitness? Sleep in your exercise clothing! Let’s face it, you are not sleeping for that long anyways. When you wake up after your few hours of sleep in your exercise clothing, you will think twice before you skip your morning exercise session. 3. If you function well during the early hours of the day, go to sleep early and wake early. Late night hours are more conducive to cake, cookie and chocolate binges, while early morning hours taste of yogurt, coffee and healthier food choices. 4. If you know you are going to be up late, budget your calories throughout the day to allow yourself a “controlled cheat” – a specific number of calories for your late night chocolate or cookies. 5. Don’t be a parking snob. Park far away and walk instead of circling the block until you get the spot right outside your destination. Many small business owners and entrepreneurs develop a methodology or expertise in one specific area. But how do you scale that uniqueness and give over your methodology and wisdom without losing your distinctive character? When hiring people who will take your methodology forward, look for people with the right personality, not the right knowledge. It’s much easier to teach someone a system, skill and method than teaching them to be intuitive, friendly and personable. You also don’t always want the person with the most knowledge in your area of expertise because they will be less open to adapting to your approach. Tanya currently struggles in two common areas. Like so many entrepreneurs, the same traits which help Tanya be so successful, can be a source of struggle as well. Tanya thinks and plans extremely fast, but often leaps before she looks. She just doesn’t sit down for long enough to think through all aspects of her plans. Case in point: she recently opened three new locations in one month – kind of like giving birth to triplets! Another example: Tanya is about to launch an exciting new venture – a cafe in one of her fitness centers. A week before launch, she suddenly realized that she hadn’t given a thought to how she was going to price the food! Tanya’s second struggle is also a common one. She currently spends 8-10 hours a day meeting with clients, and though she loves this aspect of the job she struggles with how much time she should devote to clients versus time for business development, staff management, self-preservation and maintaining clear headspace. Tanya’s business is growing and successful, so if it ain’t broke, don’t fix it. She has always thrived on this quick-think, quick-act model and she can continue operating like that. The key to continuing successfully using this modus operandi is to surround herself with people who can compliment her, yet hold her back. Either a manager, coach or consultant who can quickly work through Tanya’s plans with her so that they can ask the right questions and make sure the plans actually make sense! However, if Tanya is looking for change and is happy to listen to someone, she would probably burn through less money having her plans vetted, rather than the trial and error method she has been using until now. Work-work balance will be different for every entrepreneur. In Tanya’s case, working with clients keeps her in touch with her target audience and more importantly, keeps her happy doing what she loves. Therefore, devoting a solid amount of hours per day to client meetings is vital. In order to determine how many hours to devote to clients versus business development, Tanya only has to look at her own nutrition methodology. In the same way that she adjusts calorie count and exercise depending on how her clients are doing, Tanya can adjust her schedule by experimenting with small amounts of time for business development until she is happy with the balance of job satisfaction and business growth. Part 1 of this episode, where Tanya shares how she exploded her business over the past four years, go to estierand.com/47-1.